Fig. 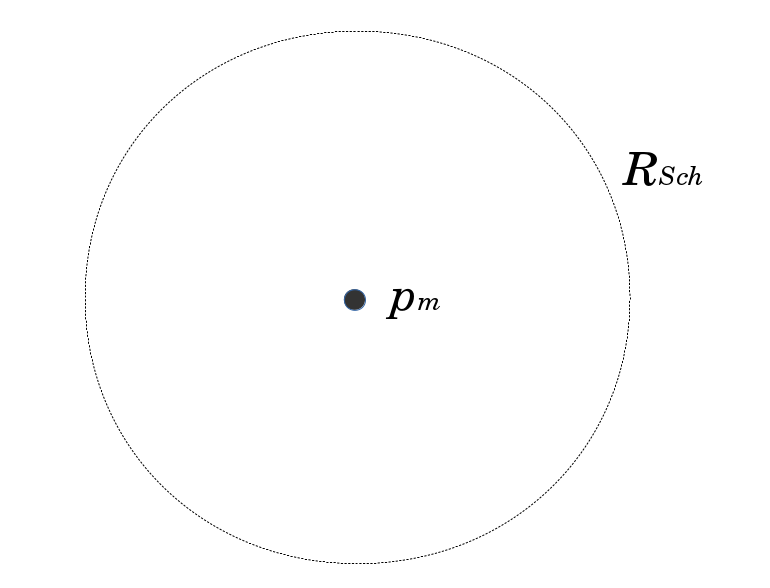 1: Minimum Conditions for Hollowness: (S) is the Shwarzschild radius, and the probability is zero that a mass particle can be found at the origin; another possibility is that the thickness of the surface (S) is very thin, and the probability is zero the particle will be found anywhere else but near (S). Fig. 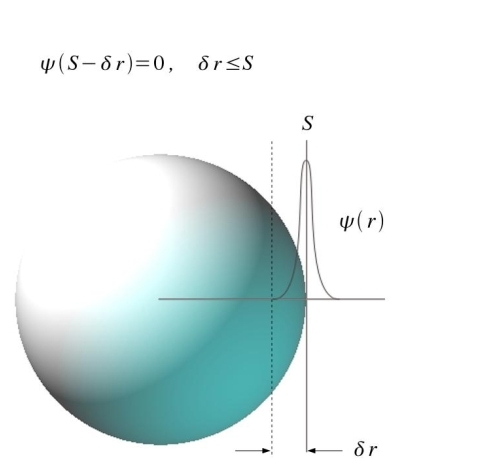 2: Gravitational Flux at the Gaussian Surface: If the thickness of the surface at (S) is very thin relative to the diameter at (S), (S) can be regarded as practically flat. Why any of this may occur is not explained nor even successfully contemplated, although a good place to start seems Heisenberg’s Uncertainty Principle, the Schrodinger Wave Function, Special and General Relativity (where else is there??) and their confinement issues. Consider the limits to the energies allowed in an amount of space, and the limits to the speed of communication; for example, an orbiting electron does not collide with a proton even though they are “very close” and their mutual attraction is extraordinary. The comparison of an electric field with a gravitational one, where the distribution of surface charge in a spherical conductor resembles the “surface mass” of a black hole would provide the added utility of precluding the black hole as a point-type singularity. It would be interesting to see under what conditions, if any, this “hollow” hypothesis can hold. 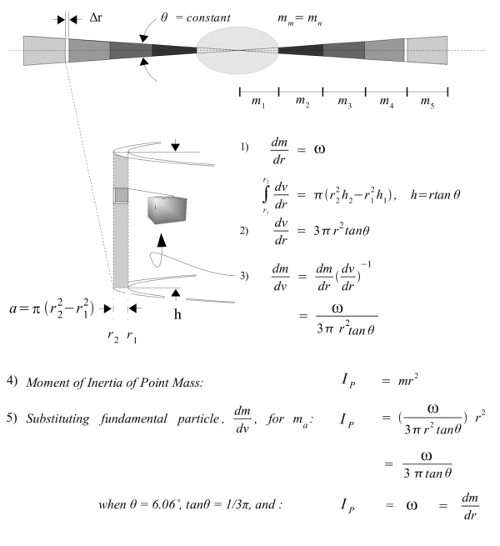 That all the gravitational flux may be limited in its transmission along the surface of a black hole, about the Schwarzschild radius, makes the relations of Equation (6) exact, and would describe the gravitational field of a black hole entirely, and is the subject of my study. Without hypothesizing on how such a classical state exists, a possible “confinement argument” is represented by this drawing that shows that for particles P, if they repel, work has to be performed across distance x to exist inside surface (S). Resistance to compression is a quantum mechanical reaction that violates classical mechanics. Because there are limits to the energy of “stationary” massive particles, as there are limits to the capacity for a particle to be stationary, defined by Plank’s Constant, I imagine a circumstance at the core of a collapsing neutron star, under such enormous compression at the core, that the capacity of a particle to remain confined at the very center is lost, and propelled outward, and unable to be replaced by another similar particle, for the very same reason, and as the remaining innermost shell of the core continues to be compressed by the increasing pressure of the collapse, a chain reaction ensues, and the star collapses simultaneously from both the outside inward and the inside outward. How can I construct a plausible mathematical argument that would prove such a collapse takes place, if indeed it does? Time delay in quantum coherence and tunneling? It would be possible that the theoretical fundamental particles in question, ie. those that comprise the entirety of the hypothetical surface, may be a particle that changes state with a period. For example, changing from having mass to not having mass, and these flavor changes corresponding to the period, may also correlate its position and direction relative to the surface and any coherence, or tunneling, across the interior of the sphere (or it’s surface): whether on the inside and moving toward the outside, or vice-versa. Whether the shell of a “hollow black hole” could be high enough in its density to equal in mass a solid sphere of a similar diameter, ie. to within a few orders of magnitude— to within the resolving power of observations required to discriminate black hole from neutron star diameters, and how these diameters correspond to the periods of surrounding orbiting bodies. Einstein: from the point of view in General Relativity that one finds it “appropriate to introduce a tensor Tuv, ” as “It is only the circumstance that we have no sufficient knowledge of the electromagnetic field of concentrated charges that compels us, provisionally, to leave undetermined in presenting the theory [GR], the true form of this tensor.” And simultaneously, to “introduce a negative pressure for which there exists no physical justification.”  the “cosmological constant”. The diagram above describes a pair of conditions that will manifest a constant rotational inertia about the center of a galaxy: both, 1) the total mass and 2) the cross-sectional area of the galactic disk are proportional to the radius. A larger version of the diagram is located here. In Standard Cosmology, the motion of matter—such as stars, and planets about stars, and objects about planets—are all moving about the centers of galaxies. These paths are presumed elliptical and are thoroughly examined in literature. The orbital motions of galaxies about other galaxies, however, are less understood; less observed, less measured. I attempt to explain this turbulent mixing of galaxies as subject to a law that is distinct in its character. Perhaps, with the simple modification that the total gravitational energy driving the turbulent mixing is gravitationally positive in composition, like that of Einstein’s Cosmological Constant; and opposed, by the total gravitational energy bound in collections of matter contained in the negative fields, as those described by classical gravitational theory. The principle that makes this circumstance possible (in hypothesis) is asserted by an argument that is based purely on symmetry and conservation: that the total negative gravitational energy of these bound collections of matter, is equal to the total positive gravitational energy hypothesized to cause the expansion of the Universe, ie. 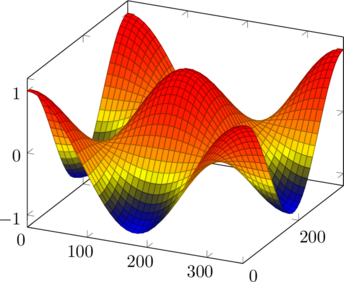 the appearance, by Doppler Shift, as quantified by Hubble’s Law. The Principle of Universe Expansion is not in dispute; the size and rate of expansion will be argued, however. This is the principle by which all study here is characterized. “Internal motions” are those elliptical orbital motions about centers of matter, such as satellites about planets, planets about stars, and stars within the Galactic Bulge; these motions are driven by negative gravitational energy, are closed and bound. “External motions” are those driven by a net gravitational energy that is positive in sign (and hypothetical), that are particular to the motions of objects outside a zero boundary. These motions not only include those of particles in the Galactic Disk but also the motions of distant Galaxies with respect to one another: closed and unbound. With respect to galaxies, I postulate that the boundary between predominately internal motions and external ones is the boundary between the Galalctic Bulge and the Galactic Disk; and that every collection of matter has a similar boundary. This principle and its cause, the central focus of my study, is to be examined continually, and throughout, with increasing detail. The space of the Universe is postulated to be finite and closed; therefore the Turbulent Mixing of Galaxies across the vast spaces of the Universe are motions along paths that are closed. These paths are closed, but these paths are orbits changing in direction that is not always planar, have average radii similar in scale to the radius of the Universe, and traverse across vast timescales. Given three vectors: Cosmological Expansion, Speed of Light and Time, what field operations can one perform upon them? With respect to General Relativity, the Robertson-Walker Line Element, and the orbital motions of stars about galactic nuclei, I thought I would experiment with multiplication. 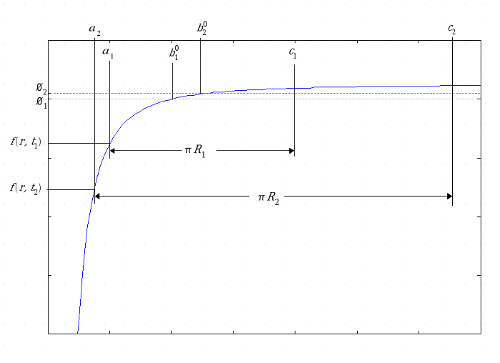 The expansion function, R(t) and the time function, T(t) are related here in that the cross product of their derivatives are constant and equal to the translation of light across a cosmological space under the influence of a distribution of gravitational energy that is being defined by the constructions in previous articles. The cross product has been chosen directly as an argument symmetrical to that of an electron moving in a magnetic field. This article diagrams previously under-emphasized information, and a consequence of the “cosmological cross product”: that the photon moves across a space that contains no net gravitational energy, and so does no work on average. However, photons reaching the Earth from great distances have not average paths, but mostly histories of travel through”empty”, gravitationally positive—though increasingly weak—postive-gravitational space. In other words, excluding gravitationally lensed photons, observed photons from very deep space have not come under any significant gravitational influence of large concentrations of matter (galaxies), ie. about regions of galactic nuclei; though have traveled during a process of Universe expansion. How the redshift of photons due to expansion, or due to time dilation escaping regions of negative gravitational energy (stars) relates to any “blueshift” that photons may obtain—caused by a path through a positive gravitational expansion—will hopefully be examined subsequently. Is flat space a coincidence? 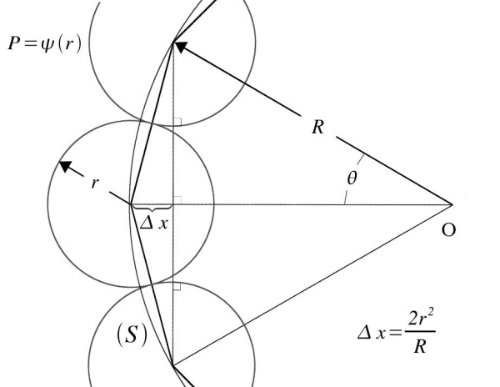 Is it possible that a Euclidean space is a requirement for the existence of observers? Is it an accident? And will all observers, past and present, always measure their observable space as Euclidean? 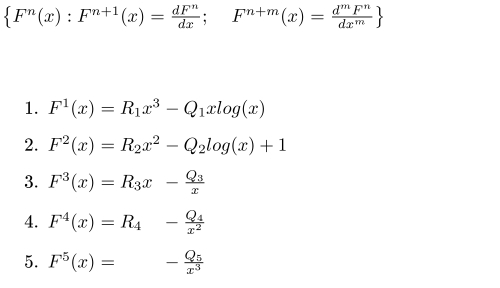 What I’ve been playing with is a problem outlined in the sketch “On a Dynamic Equilibrium for the Distribution of the Gravitational Force in Cosmological Space”. The paper is a casual description of changing function values, and their derivatives, with respect to time. The essence of the paper is to fix the course of these function values to that of a negative gravitational force minimum, a null gravitational force, and a positive gravitational force maximum, over an average collection of bound galactic material in the cosmological space defined by the paper nicknamed Zero. For no other reason than curiosity, the paper exploits a coincidence in the function under examination and constructs a representation in matrix form. It becomes evident that if the function values are to change as described in the paper—that the derivative of the gravitational force minimum increases as the derivative of the null gravitational force decreases—that the integral between these two points must also increase [image]. Yet it will be an assumption of the theory that this integral does not change, even as the function values and their derivatives do. The brief mention of the problem is at the bottom of page 4, highlighted in yellow. If the integral would be made invariant, forced mathematically, with respect to time, by changing the function in no other way than a the change in the value of the exponent, the consequence would result in the relative flatness of one space-time to another. The interest in another paper, “Analysis and Computation”, will be in how this exponent, and the function values change continuously across time and how a theoretical observer in the present, measures the continually changing gravitational power of galactic nuclei across vast space-time distances. Is it a coincidence that we exist in a locally flat space? 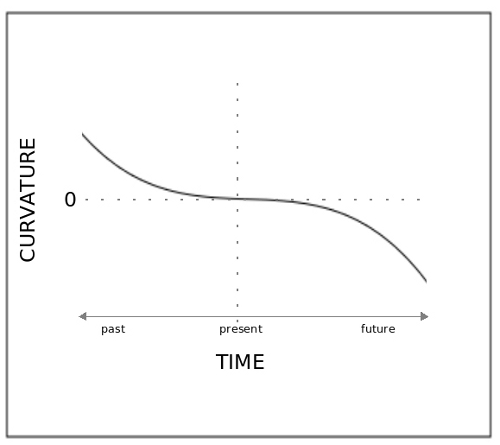 Or does our space only appear locally flat—relatively flat to the past and the future? Does this hold sway for all observers across all time scales? It’s pretty unarguable that the basis for any mechanical human creation is our understanding of the physical sciences. In this knowledge base it has emerged that across the decades, certain fundamental constants emerged in our description of the behavior of this material with respect to motion, including heat and time. These fundamental constants, such as Plank’s, Newton’s Gravitational Constant, Einstein’s Speed of Light, etc. weren’t simultaneously conceived, but were so over time. So therefore one could reasonably expect more in the future, and not only because every consistent theory is incomplete, but particularly since it is a given that all knowledge—say, in the study of motion—is not revealed. It’s reasonable to expect that not all fundamental particles have been observed, at will, and in the laboratory. The fundamental particles of gravitation can evade our direct observation, and especially or control in the laboratory, for thousands more years. In Standard Big-Bang Cosmology, Hubble’s Law plays an important role in measures of length across very large distances. Apparently, there is a Universe out there that is physical space. According to Einstein, all the information we receive from it is from the past, and the further along we look, and the deeper and deeper we see, and the greater and greater is the magnification of the lens, or other measuring apparatus, the longer ago this information was sent. Doppler Shift measurements of light from deep space indicate a correspondence between the magnification of the lens and the Doppler Shift of the specks of light that gives every indication they are very, very large structures, very far away. In Standard Big Bang Cosmology, these large structures, can be extrapolated backwards to have existed in a time when the Doppler Shift measurements and our ability to detect light appears to vanish. Increased magnification continues to help; theoretically, there will always be a period of time between the “moment of creation,” and our ability to measure light. That shouldn’t bother us; what annoys in this cosmology, is the postulate there exists a moment of creation. As a result, we are obliged to speculate on the nature of the spatial origin and a time beforehand: that Unique Singularity, and that incomprehensible time prior. This is unacceptable to rational thinking. Making a statement on the ultimate properties of matter, that it had been created at one moment and forced to exist the next, that it continues to exist and manipulate the behavior of other moving bodies according to certain laws, will be certain to influence, and be the influence of, the character and the rendering of these laws—because a necessary reciprocity should exist between the theory of the origin of matter with it’s behavior. One cosmology may state that matter had been created in a single moment, while another may hypothesize that matter had always existed in some state over a time-space that is infinite. I like to imagine an infinite time-space as a theoretical basis, more so than a finite one—as the topology is a simpler, more continuous one and precludes all the persistent questions of creation. It seems impossible, however, to accommodate mechanics with the concept of infinity. Is this a dilemma? At first impression, the concept of infinite spaces and times are difficult to accept, much less comprehend; they appear to invoke irrational expectations of the physical realm. However, in one real solution presented here, the longer time ago one makes a measurement of scale, the closer are adjacent objects, which it turn correspond to a slower speeds of their communication relative to the speed of communication here on Earth. Specifically, this correlation function is not linearly related to the present day, but quadratically. So, that as one increases the magnification, the farther one may observe, but also the longer is the time scale between their adjacent spatial intervals. I read that Standard Cosmology does not like quadratic functions describing the relationship between distance and time (for various reasons), mainly because Hubble’s Law, which dominates standard cosmological observation, is a linear relationship: that is, looking through telescopes strongly suggests this. Is there a quadratic function that could look linear across vast distance and time scales? If so, what topology of space and time would look linear to an observer on Earth, not conflict with Hubble’s Law, that is, appear to extrapolate to a finite time in a closed space, with an apparent origin of some spatial singularity, but be descriptive of an actual infinite time scale without origin? Measurements of distance, made across vast time scales, may be the result of a composition of functions, such as those above. It goes without saying that the slope to the right, pictured here as unity (for visual effect), can be made arbitrarily flat, indistinguishable from y=1. 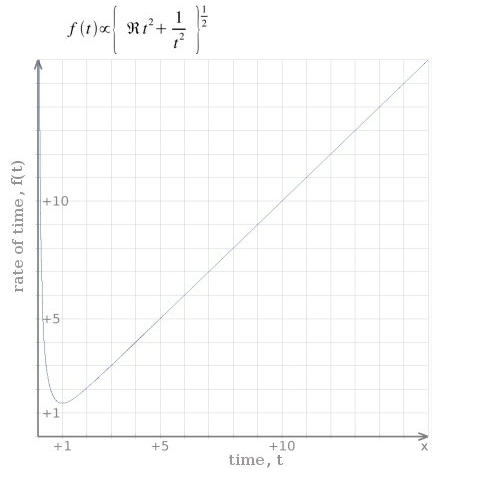 The function f(t) is merely the Pythagorean sum of two vectors whose cross product is always equal to R, independent of time, t. If R is very small relative to numbers for t, then the rate of time is nearly constant for numbers of t. In effect, this would describe a circumstance where any change in the rate of time, if it were to be measured in the present day, would be close to zero and consistent with standard laws of mechanics. If R is close to unity, however, a condition would be described where a change in the rate of time, if it could be measured, would not be as close to zero. In either case, as t approaches zero, one Earth Year of time in the present day would become equivalent in scale to innumerable Earth Years, potentially hundreds of trillions of years, of the “early” Universe. Ofcourse, the word “early” loses it’s meaning here, where the distances of separation between adjacent particles are relatively close to zero, their speed of communication relatively close to infinity, and which appears as faint as it does stationary from telescopes here near Earth. This Statement of the Problem is an incomplete paper and so has variations. Mostly corrections of typos and/or sophisms are made, with changes in language to improve clarity. As a result, it is dubious it could even be understood as is, a mere collection of thoughts. The fundamental emphasis of the problem is the following. 1) the function values at some function maximum, an. 3) the integrals, between the upper and lower limits of the domain: set to unity. 4) the intervals -the distance between an and b0, ie. b0-an=1: set to unity. 5) the function values at some b0, ie. f(b0)=0. 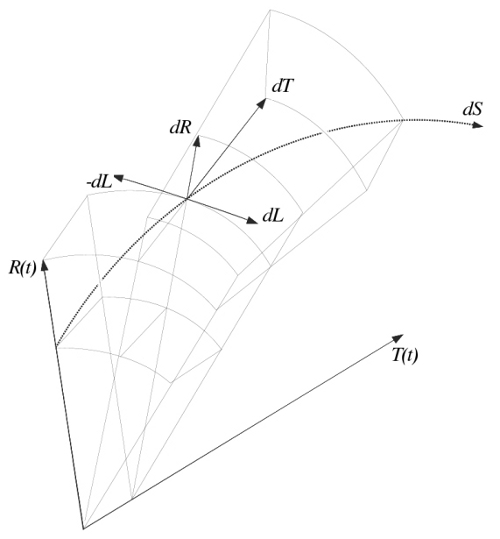 Figure: A collection of matter, f(r, t1) contracts to f(r, t2) driving Universe expansion from R1 to R2 . The purpose of the study is to exploit as many gravitational parameters as reasonably possible, while simultaneously applying as many reasonable constraints in as many possible combinations -of both hypothetical and standard variables- so that ultimately, the apparent orbital motions of galaxies can be most simply explained: “most simply explained” meaning both as 1) a more representative, and corresponding measure of the observables: observed redshifts and observed apparent magnitudes in relation to observed matter with respect to its observed orbital motions, and 2) with a more reasonable, or, at least, equally reasonable, set of assumptions as Big Bang Theory, Inflation, Dark Matter, and other theories. In the above example, P=1; signings and constants are assigned for simplicity. Note the continuity and discontinuity of the partial derivatives for a class Ck smooth function..
A change from variable ‘x‘, to variable ‘r‘ in F4(x) to F4(r) yields a function in the form of an inverse square law of force with a positive constant, R4. A change from variable ‘x‘, to variable ‘t‘ in F3(x) to F3(t) yields a function whose shape is explored elsewhere and whose effects as a cross product with F4(r) are outlined in “Statement of the Problem” [See Article 4]. I ponder the meaning of this cross product of two functions of two variables, one the derivative of the other, one in time units, one in distance units and whether it is merely coincidental or meaningful to the changing structure of space-time. 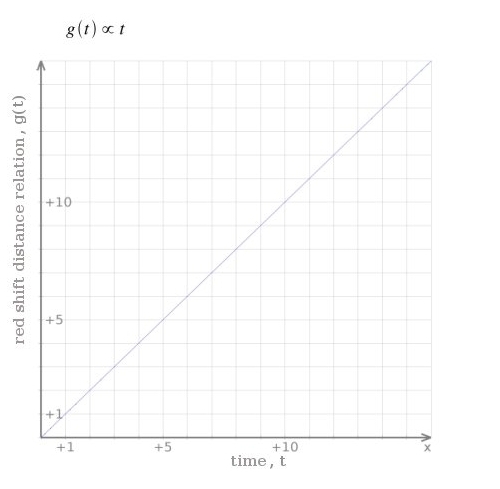 If the equations above were somehow representative of the dynamics of time and space vectors across cosmological time and distance scales, then how is this change in the “relaxation time” somehow representative of Universal Expansion, can this be useful? What would be the dimensional units, the numbers of dimensions? What is this Meta-Space-Time? In “Statement of the Problem” the product of F4(r) with F3(t) is defined as a vector field, a gravitational field, that changes with time in such a way that as t approaches infinity, ie. forever (the total life-time of the Universe), R4 approaches zero, and the field approaches a conservative field in 4-space.